A year or so after we moved into our house, there was a knock on the door. The man who knocked had a question, because our homes had been rehabbed on the same program, the same year, and he had had serious problems with the work. We had had a different contractor (the city picked the bids, we had no say), and had to tell him that although our outfit was not the most competent, they were not crooks, and we couldn't help him with his case. He was very pleasant, we chatted a while, and he went his way. A couple of days later, he came back. He was a master gardener and had noticed that we had put in some fruit trees inside our back fence, and he wanted to know if we would like to have a new, dwarf apple tree for the side front of the yard. We accepted that kind offer, and it was planted and tended; we anticipated delicious apples, knowing that it would have to grow at least a year or two, possibly three, before it could bear any fruit. Then one day in its second season, a couple of neighborhood boys were roaming around and showing off, and one decided to play Jack-be-nimble with our little tree. He took a running start, leaping as high as he could, and utterly failed to clear the top of it; in fact he broke it in two, leaving the upper portion, which included every tender branch it had, dangling by a thin strip to the ground. When my husband came home, he was very angry, and his first impulse when he saw what had happened was to storm over to somebody's parents. I hadn't seen the action, or I certainly would have intercepted this kid and sent him on his way before he could take that flying leap. Our only witness was a child, and I'm not sure we even knew which house to go to because the boy didn't live on our block. This little tree had been a gift, and we looked forward to having apples that would be used for pies, cakes, and applesauce through many years to come. Now it was destroyed through a childish, thoughtless impulse. However, on careful inspection, there was one little nub below the break -- not a branch, but a possibility. We agreed to watch and see. My husband carefully trimmed the devastated top off clean and watered the remnant of the little tree, and hoped. One of our daughter's friends came by a few weeks later, and asked her why we were growing a stick in our yard. Our daughter replied that it wasn't a stick; it was her dad's baby apple tree. The friend reacted with complete disdain. "That's not a tree, it's a stick! It will never do anything. You should get rid of it. Your yard would look much better without it. It's just going to die." That remnant did not die, and the little nub began to send out shoots of green. They were very few and small that first season, but they gave us hope. They steadily increased, and multiplied, with time, and though the nub was only meant to be a branch, sending out to one side, it became the support of everything that grew out of it, and tilted the little tree-that-came perilously towards the ground with all the weight. We were afraid that its lopsided growth would cause the roots of the tree to pull out from its other side and topple it, after everything that had happened, so we found a cinderblock and placed it on the ground, wedged beneath that branch-trunk for support. We couldn't allow it to overbalance and uproot, losing the fight after all our patience and faith. That block pushed up against the trunk held it in place till its own increased strength could bear it up; we had it pruned so as to encourage growth through the almost empty center so that it would become balanced in its structure, and now it thrives. We lost a year's harvest by that move, but gained a good, thick tree. Near the ground, it still goes on a twist sideways, but it is well-rooted and stable. 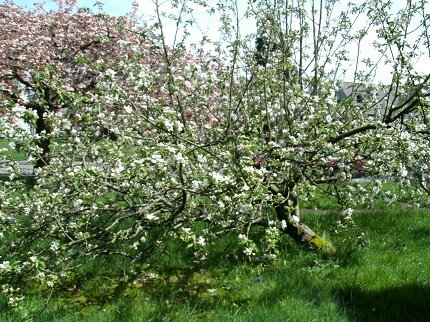 It may not stand proud, but our apple tree is cherished. It has been pruned and picked, and cherished. 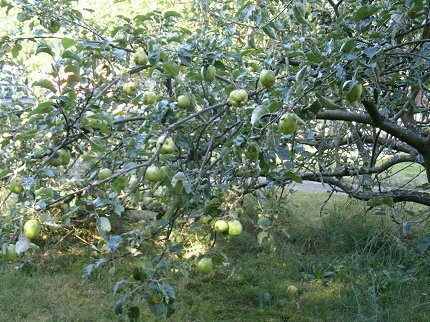 Our formerly-little tree gives delicious apples, huge ones, in abundance, and feeds our family happily all winter. The best year we put up thirty-eight pints of applesauce and four gallon bags of dried apple slices, not counting what we cooked in pies and crisps and ate as we went. The "stick" did indeed do something. It just needed care and time. Our Heavenly Father likewise keeps hope in each of us, and patience, knowing we can grow. He takes the long view, even when we can't see the hope of results from what we are going through, or any outcome better than the immediate, imperfect one. When our lives are damaged and broken, he still sees more than a doomed, barren stick. He knows whether our roots are still strong, and if he has to work from the level of the roots, he will do that too. He is a much better Gardener than we ever are. Sometimes his actions are temporarily hard to bear, like the drastic pruning we had to do for the long-term good of our apple tree. He knows what we are capable of, and what we truly need, and guides and prunes our lives to increase our ability to bloom. If we will trust and follow him, he promises we will bear abundant fruit in time. Like the apple tree, we will eventually bear abundant fruit.